I’m never sure whether it says more about lingering Australian Anglocentrism or the brilliance of the marketing team behind the Booker, but I’ve always found it odd we get so excited about the Booker Prize yet barely register the major American awards. Either way, yesterday saw the announcement of the National Book Awards in New York, with the Fiction Award going to Jaimy Gordon for Lord of Misrule, the Non-Fiction Award to Patti Smith for her memoir, Just Kids, and the Poetry and Young Adult Fiction Awards going to Terence Hayes for Lighthead and Kathryn Erskine for Mockingbird. Unfortunately I haven’t read any of the winners (though it’s probably worth noting Lord of Misrule pipped Peter Carey’s Parrot and Olivier in America to the Fiction Award) but there was a nice overview piece about the Fiction shortlist by Tom LeClair in Salon earlier this week if you’d like to know more. I always find the NBA more exciting. Haven’t read any of these either – but I love the title and cover, so not a bad start! I’m interested by the fact it’s set in the same world as one of my favourite books of the last year or so, Willy Vlautin’s Lean on Pete. Which does of course prompt the question of what the great Australian horse-racing novels are. The only one I can think of is Tree of Man, though it barely qualifies, and perhaps Craig Sherborne’s wonderful “memoir” Hoi Polloi, though again it’s not really about the racing. Yes, I thought of Vlautin instantly — one of your best recent recommends. Strange, isn’t it. I’ve found myself generally preferring American over Bristish novels over the last five years ot so. 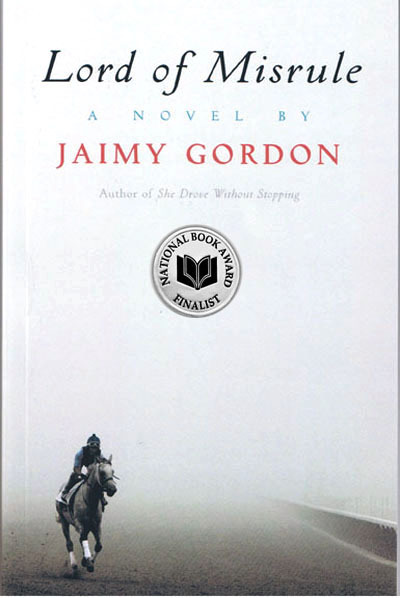 James, our great (unsung) horse-racing novel is Gerald Murnane’s: Tamarisk Row. Of course! Though I have to confess I know Tamarisk Row by reputation rather than in any more intimate manner . . .
Tamarisk Row by Gerald Murnane is a great Australian horse-racing novel. Dunno how that colon got in there. I also meant to say, isn’t the focus on the Booker not so much Anglocentrism but something as simple as Australians being eligible for it, and therefore publishers, literary journalists and so on having some stake as well as writers themselves, hence growth of buzz? It’s a genuine question, as I have no idea whether they/we are eligible for the National Book Award or not but had always assumed not, since it’s ‘National’ and I can’t remember any Australian book ever winning it. If not, I assume Carey is because he lives there or has dual citizenship or something. I think that’s a fair comment, and I actually don’t know about eligibility: given you never see English books on the shortlist I assume you have to be an American or have a green card or something to be eligible. But it’s also about the way our historical status as a colonial offshoot of British publishing continues to define our literary culture. And the fact that our literary traditions are more closely aligned with those of the British (certainly our canon much more closely resembles the English canon than the American). But it is a pity we still leave most of the choices about which American books we read to the London offices of the multinational publishers. By the way James, have been inspired to return to Steinbeck’s Log From the Sea of Cortez! I don’t feel you needed a lot of prompting on that count. That would explain some of it. I know what you mean about British writing and publishing, though. Just Kids is surprisingly good. (I’m book-starved in Cambodia so it may be nostalgia and rose-coloured glasses talking but I was unexpectedly impressed). Great to see Jaimy Gordon getting this kind of recognition. I’ve known her well and followed her work since she began writing in the 70s with quirky small-press publications. Only recently has she gained much “mainstream” attention. A heartening example of the success that can sometimes come eventually if you trust to your own voice and ignore fashions. Good heavens, Ian, is that you? Not sure of the etiquette of this little side-conversation on someone else’s site, but yes, I am (from my point of view) the real Ian. I confess, by the way, that I was also an “Anon” in one of your own blog threads recently (but am not necessarily every Anon).